Directions: Turn right at center of town onto Court Street. (US-202/10, the Athenaeum will be on your right, the town green will be on your left.) Following Court Street, take your second left onto Pleasant Street. At the first set of lights, take a right. The school is on your left. Title 1 events are held in the cafeteria. Enter through the double doors to the left of the main entrance. Directions:From the Mass. Turnpike, Exit 3, take a right onto US-202/10 (N. Elm St.). Stay on US-202/10 for approximately 1.4 miles. At your sixth set of lights, turn right onto US - 20 (Franklin Street) Continue on Franklin Street for about 0.4 miles, take a right onto Franklin Avenue. Continue for approximately 0.1 miles and the school will be on your left. Title 1 events are held in the cafeteria. Enter through the main doors and the cafeteria will be straight ahead. Directions: From the Mass. Turnpike, Exit 3 take a right onto US-202/10 (N. Elm St.). Go approximately 1.6 miles. Turn at center of town onto Court St. (the Antheneum will be on your right, the town green will be on your left.) Stay on Court St for approximately 0.8 miles the school will be on your left. Title 1 programs are held in the cafeteria. Enter the building though the covered entryway and go right. The cafeteria will be on your right. Directions: From Mass. Turnpike, Exit 3 take a right onto US-202/ MA-10/ Southampton Road. Continue 0.1 miles. Turn left onto Holyoke Road for 1.9 miles. Turn right onto E Mountain Rd and drive 0.4 miles. Turn right onto PaperMill Rd. The school will be 0.4 miles on your left. Title 1 programs are held in the cafeteria. Enter the building though the covered entryway.The cafeteria will be on your right. Directions: From the Mass. Turnpike, Exit 3 take a left onto US-202/10 and go approximately 0.6 miles. The school is on your left and the entrance road is just past the building. Title 1 programs are held in the cafeteria. Enter though the doors under the overhang. Go straight through the double doors. Cafeteria is on the right. 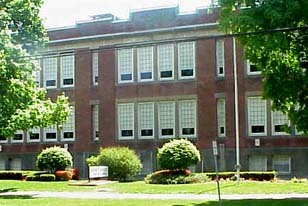 SOUTH MIDDLE SCHOOL. 30 West Silver St. Directions: From Mass Pike Exit 3 bear right on10-202 South. Continue on N. Elm Street, across bridge and through downtown. Remain on 10-202 S until you pass the Westfield Athenaeum on your right. Directly after the Athenaeum turn left, then left again (still 10-202 S) onto Pleasant St. At the light turn left onto West Silver St. The school will be on your right. WESTFIELD HIGH SCHOOl, 177 Montgomery Rd. Directions: From Mass Pike Exit 3 bear right on10-202 South. Turn right onto Notre Dame St. and continue until Montgomery St. Turn right onto Montgomery St. for .7 miles. School is on your right. Directions:From the Mass. Turnpike, Exit 3, take a right onto US-202/10 (N. Elm St.). Stay on US-202/10 for approximately 1.4 miles. At your sixth set of lights, turn right onto US - 20 (Franklin Street) Continue on Franklin Street .6 miles. Turn left on Smith Avenue. School is .2 miles on your right.